Make the Crowne Plaza Concord/Walnut Creek your home base for your next visit to Saint Mary's University of California! Just a 20-minute drive from the SMC campus, our upscale Concord hotel offers everything you need for your upcoming trip to St. Mary's. With free parking, free WiFi, great on-site dining options, and some of the East Bay's premier pet-friendly accommodations, you'll be fully equipped for a successful St. Mary's visit. Whether you're cheering on the Gaels, attending an alumni function, or touring the campus for the first time, you'll feel right at home during your next trip to St. Mary's. Book our discounted school rate and start planning upcoming visit to Saint Mary's College of California! Graduation is just around the corner! On May 25th and 26th, we will be celebrating the academic achievements of Saint Mary's College of California's esteemed Class of 2019 at SMC Stadium. Since Concord, Walnut Creek, and Moraga can be very busy on graduation weekend, we recommend you make your dinner reservations in advance and allot extra driving time for SMC traffic. A limited number of rooms are available for St. Mary's 2019 Spring Graduation. Book your room with corporate code 100205945 to enjoy special SMC discounts for this year's Saint Mary's Graduation weekend! Put on your red and navy, head to the McKeon Pavilion, and cheer on the Saint Mary's Gaels during your upcoming visit to Concord! With an impressive showing in the 2017 NCAA tournament, the Gales' men's basketball team is poised for another impressive season as they pursue their second regular season conference championship in three years. Get excited about the 2017-2018 NCAA basketball season and don't miss the chance to see the Gaels live in action in Moraga, CA! Let's go Gaels! Want to know more about Saint Mary's College of California? Sign up for a campus tour to learn more about the facilities, history, and culture of SMC! Ideal for prospective students and their families, campus tours give an inside look at life as a Gael. The school offers two tours per day each Monday through Friday and on select Saturdays. For the most detailed introduction to the school, sign up for a tour with an added informational session. After your tour, feel free to keep exploring St. Mary's on your own, grab lunch at the Golden Palace, and talk through your exciting campus tour. While most of the dining options on St. Mary's campus require a meal plan, there are plenty of amazing restaurants in Concord, Walnut Creek, Moraga, and beyond. For a delicious, convenient meal with a great atmosphere, don't miss our on-site Vineyards Restaurant & Bar. After an enlightening campus tour, enjoy creative, homemade dishes like curried butternut squash ravioli and prosciutto flatbreads as you weigh the pros and cons of four years at Saint Mary's. Heading to McKeon Pavilion to cheer on the Gaels? Stop by Vineyards Restaurant & Bar between 4:00 p.m. and 6:00 p.m. for happy hour drinks and snacks! St. Mary's College of California is located just 12.5 miles southwest of the Crowne Plaza Concord/Walnut Creek hotel, about a 20 minute drive. 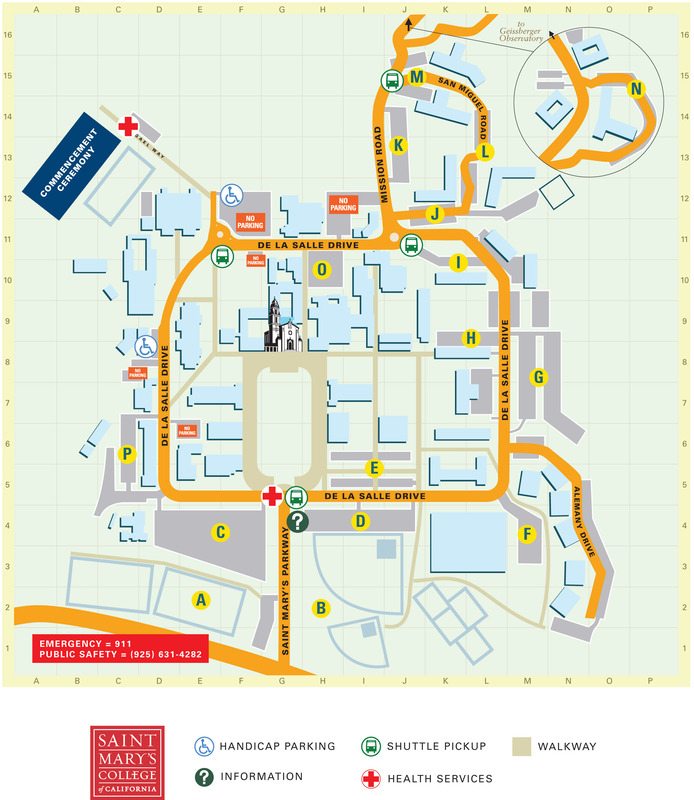 Parking is always free at our hotel, and Saint Mary's has a handful of visitor lots on and around campus. To obtain an SMC visitor parking permit, just stop at the Public Safety Front Gate (you can't miss it), and they'll be happy to help you!